We just posted an eight-projector shootout of the cheapest 1080p home theater projectors on the market, ranging in price from $499 to $649. However, for a small step up in price you get a significant step up in image quality and/or features. 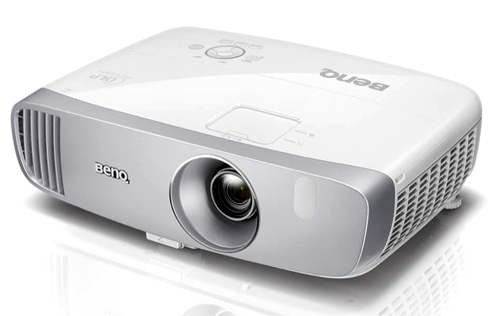 Compared with the sub-$650 models, the BenQ HT2050A--along with the Epson HC 2150-- delivers a significant step up in picture quality, with noticeably darker blacks, higher contrast, and better three dimensionality with 2D images. Though the HT2050A has the lowest brightness rating (2200 lumens) of the three projectors in this group, after you adjust them all for the best video pictures the HT2050A is a close second in brightness to the Epson HC 2150. Brightness with video optimized settings, at 1,500+ ANSI lumens, is enough with a 1.3-gain screen for a 200" diagonal 16:9 screen in a dark room or a 125" screen with moderate ambient light. Our sample measured a comparatively low brightness uniformity of 61% (a separate measurement of an HT2050 which has the same light engine configuration measured 67%). Classic Dark Home Theater: Excellent color accuracy, contrast, and three-dimensionality for 2D video; a solid black level; very good shadow detail for the price; virtually no rainbow artifacts; and no worse than typical brightness uniformity for an inexpensive DLP projector makes the HT2050A a superb choice for home theater for the price. It is easily bright enough with video optimized settings for the 180" maximum screen size that BenQ recommends for best sharpness. Ambient Light Viewing -- TV Substitute: Even in its brightest preset mode, at 1,839 ANSI lumens, color is within a realistic-looking range, making the HT2050A an excellent choice for ambient light viewing as well. With a 1.3-gain screen and video optimized settings, it is bright enough for a 125" diagonal image in moderate ambient light, and for daytime light level you can switch to the brightest mode. Portable use (room-to-room, backyard movie nights): The HT2050A hits all the right marks for portable use: It is bright enough to stand up to ambient light, light enough to move easily, and the onboard audio delivers all the volume and sound quality you'll likely need. Video Gaming: For gamers, the 16.4 ms input lag makes the HT2050A a top-tier choice. 3D Display: Although not as bright as the Epson HC 2150 in 3D, it is still brighter than most of the competition. It also handles 3D-specific issues well, with no crosstalk and just a hint of 3D-related motion artifacts, making it a good choice for an occasional movie in 3D. 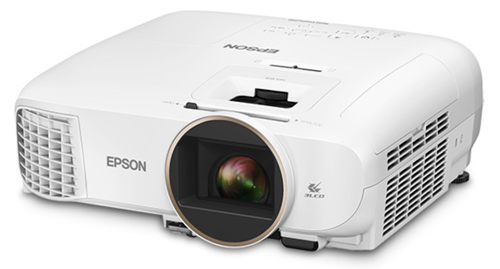 Like the HT2050A, the Epson Home Cinema 2150 delivers convincingly better looking images than the sub-$650 projectors. It is officially $899, but sometimes as little as $699 with periodic promotions. Compared with the HT2050A, the HC 2150 is tied for color accuracy and sense of three dimensionality, and it is similar for contrast. It doesn't have as dark a black level, but it delivers slightly better shadow detail separation. It is also the brighter of the two, at 1,790 ANSI lumens with video optimized settings, and brighter than its rated 2,500 ANSI lumens in its brightest mode, at 2,823 ANSI lumens. As with the HT2050A, the brightest mode offers color within a realistic range, making it more useable than the brightest modes of some projectors. Classic Dark Home Theater: The HC 2150 is a top choice in this group for home theater, thanks to its color accuracy, contrast, three-dimensionality for 2D video, top-tier shadow detail for the price, and the guaranteed lack of rainbow artifacts. It is bright enough with video optimized settings to light up a 220" diagonal 1.3-gain screen in a dark room. Ambient Light Viewing -- TV Substitute: Thanks to its high brightness and realistic looking color even in its brightest mode, the HC 2150 is the best of the three for a family room. Even with video optimized settings it is bright enough for a 140" 1.3-gain screen in moderate ambient light. Portable use (room-to-room, backyard movie nights): In addition to being bright enough to stand up to ambient light, the HC 2150 is light enough to move easily, and for small groups the onboard audio will be all you need. For large groups, plan on adding an external sound system. Video Gaming: Serious gamers who want the quickest possible response may want to opt for a projector with a 16 ms input lag. Casual gamers should find the 28 ms input lag acceptable. 3D Display: The HC 2150 lets you choose between its lower brightness 3D mode, which is still brighter compared to its 2D modes than typical, and a higher brightness mode with less accurate color. In addition, I saw no crosstalk and only a hint of 3D motion artifacts in my tests, all of which makes the HC 2150 the top performer in its price class for 3D. The BIG advantage of the Optoma GT1080Darbee ($749) is its short throw lens. It can fill a 120" diagonal 16:9 screen from just 4.3 feet, compared to the minimum of 10 feet needed for the HT2050A or 11.5 feet for the Epson 2150. At just 5.5 lbs, it is a couple pounds lighter than the other two, so it is ideal for setting up quickly on a low table as needed. Though rated at 3,000 ANSI lumens, after adjustments for optimum video it is not as bright as the 2150 or the HT2050A. However, at 752 lumens, that's still enough light for a 140" 1.3-gain screen in a dark room, or an 85" image with moderate ambient light. The Optoma GT1080Darbee isn't quite in the same class for picture quality as the Epson 2150 or the BenQ HT2050A, but it is a step above the eight sub-$650 models we recently looked at. As is typical with inexpensive DLP models, it scores well on contrast, shadow detail, and black levels, roughly matching the Optoma HD29Darbee ($649), which has the same DLP chip and Darbee video processing. The GT1080Darbee delivers more accurate color, however. Classic Dark Home Theater: If you need the GT1080Darbee's short throw to give you a big image in a tight space--e.g., 120" from 4.3 feet--it is a strong candidate for home theater in a dark room. It delivers excellent shadow detail for the price, along with good contrast, color accuracy, three dimensionality, and black level, and a no worse than typical level of brightness uniformity for the price, plus high enough brightness to light up a 140" 1.3 gain screen. Ambient Light Viewing -- TV Substitute: Count the GT1080Darbee as useable, but somewhat limited as a TV substitute in a room with ambient light. Its video optimized settings are suitable for only an 85" image with moderate ambient light and 1.3-gain screen; its somewhat brighter Game and Vivid modes lose the subtle shading that help make close ups of faces, for example, look rounded and three dimensional; and its brightest mode has too much green bias to ignore for film and video. Portable use (room-to-room, backyard movie nights): The 5.5 pound weight and included carrying case make the GT1080Darbee an excellent choice for portable use. The one hedge is that if you need it for a large group, you'll need an external sound system for it. For small groups the onboard audio will serve nicely. Video Gaming: The GT in the name stands for Game Time, and the short throw, portability, on-board audio, and fast input lag--at 16.8 ms--are all aimed at gamers. With Vivid and Game modes measuring over 1100 lumens, there is ample light for set up in low to moderate ambient light. It also helps that any loss of subtle shading in Vivid and Game modes isn't noticeable with games. If you want the combination of the short throw, easy set up, and rapid response, this is the projector you're looking for. 3D Display: The GT1080Darbee shows only the typical brightness drop with 3D mode and no crosstalk in my tests. The level of 3D-related motion artifacts is a bit more obvious than typical for current projectors, but no more so than used to be standard. For occasional 3D use it works fine, but for those really into 3D viewing the Epson 2150 is the better option for picture dynamics. we include performance data here. Low Lamp Mode. Eco mode reduces light output by 23% compared to Bright mode. Video Optimized Lumens. For film and video, Cinema mode with some minor tweaks delivers realistic-looking color at about 750 lumens. Video Performance with Brighter modes. For higher ambient light, both Game and Vivid modes are good enough for casual use for a backyard movie night or daytime in a family room. Color accuracy is easily within a realistic range, but close-ups of faces lose the subtle shading that helps add a sense of three dimensionality. Bright mode shows too much green bias to ignore for video and film. Brightness Uniformity. 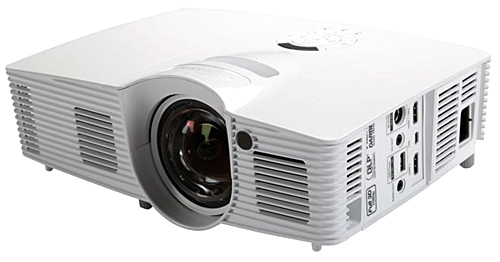 The GT1080Darbee's brightness uniformity is 67%, which is typical of many projectors in this price class. The shift in uniformity is gradual across the screen, so there are no hot spots or noticeable vignetting to create visible distractions while viewing film/video. Fan noise. The GT1080Darbee scores well on fan noise. In Bright power mode, the steady white noise is low enough in pitch and volume that most people won't notice it in a family room with ambient noise during quiet moments in a movie. In Eco mode, you have to be sitting right next to the projector to hear it even in a quiet room. In High Altitude mode, fan noise in Bright mode is loud enough to be intrusive in quiet moments in any room. In Eco mode, it is only slightly more intrusive than in Bright mode with High Altitude mode off.